Kellyanne Conway: You Can See The Fruit Of Donald Trump's Genius All Over New York City [VIDEO] - Joe.My.God. Donald Trump campaign manager Kellyanne Conway said Tuesday that her boss has “paid hundreds of millions of dollars in taxes over decades,” pushing back against reports that the Manhattan billionaire could have used provisions in the tax code to avoid paying federal income tax for up to 18 years. “You didn’t say income taxes,” anchor Norah O’Donnell interjected. “Well he certainly has, in years that he made a profit, like anybody else, he paid income taxes,” Conway replied. Trump has not denied the New York Times report and has stubbornly refused to release his tax returns, something every presidential candidate has done since Richard Nixon in 1972. 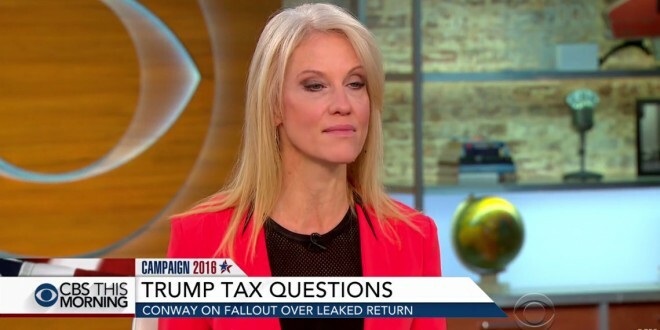 Asked on Tuesday how Trump managed to lose nearly $1 billion in 1995, Conway said “well, we don’t know that,” but added that the real estate market struggled in 1995.